Not terrible but the taste of alcohol is a little overpowering. The color is a little less interesting that I would have liked. The smell of the beer is a bit bland but the feel is slightly better. Overall there are many better choices in this style. Pours very dark with a nice mocha head that fizzles out quickly. Nice chololate aroma, some molasses and brown sugar. Slightly thin mouthfeel, but not bad for 8.5% abv! Lots of bittersweet chocolate, burnt brown sugar, charred barrel, dark roast coffee. Arno nation helps out with a creamy mouthfeel. Overall I would call this the first "session BA imperial stout" I have ever tried. It is good, but I think the brewer could make this better if it were 11%. I like the beer, and bought a few to age. This was not a good idea. The first one I drank had s lot more flavor to it. This one is starting to fade, and the barrel feels more like a red wine barrel than a bourbon barrel. I would recommend drinking this beer fresh. A - Dark brown/black pour with thick tan colored lacing. S - Oak, bourbon, cherry, light char, delicate spice. T - Spicy bourbon and char, no more, no less. M - Medium body with with some lip smacking stickiness. Satisfying. Although feels like a milk stout getting lost a little bit with the BA. That said the bourbon isn't overwhelming. Pours black with a half inch tan head. Aroma is burbon and roasted notes. Taste is also burbon and roasted notes but neither is overpowering. Feel is a bit astringent, not too much but keeps it from being great. Overall, a nice drinkable BA stout just not best in class. Traded for this a while back with a good friend up at the Cloverleaf, as I finally got around to this on yet another rainy spring day. First time ever having anything from Double Nickel as their offerings are not available in this part of the Garden State. Regardless, this was a nice first offering as it had to be one of the smoothest examples of the style that I've had in quite some time, if not ever! 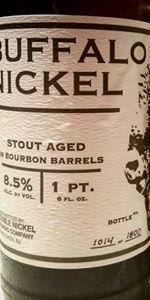 The pour to this was what one would expect from a Stout of this sorts, as the beer was dark, black, and opaque with a moderate amount of toffee head that quickly settled. Lots of bourbon stickiness, toffee, coffee, and espresso in the nose as the more colorful notes came out in the taste. Bitter chocolate, raspberry, oak, caramel, and peat all came out in the taste as the Bourbon came out more but was nicely complemented by the chocolate and berry notes that gave it wonderful depth. A wonderful woody aftertaste served as a reminder as to how this was aged and how this differed from a typical Stout that had stronger roasted and boozier aspects. Speaking of booze, there was plenty here but it was just the right amount as it complemented the range of flavors without overpowering them. While the fruit and chocolate presence wasn't strong, it was enough to elevate this up another level and keep this from feeling too ashen or sticky. A great brew that came across as an accessible example of this style. Shame that they don't distribute more to these parts! LOOK: dark black, medium light brown head. TASTE: roasted malt, whiskey, pretty smooth. FEEL: astringent bite, low to medium carbonation. Very nice BA stout. Just had Weyerbacher SMS before and this hds it's own. Bottle No. 1465 of 1800. Poured into snifter glass. It pours a completely opaque black with one finger of mocha-colored head and lacing that dissipated quickly. It smells of roasted malt, black coffee, dark chocolate, caramel, and only a mild whiff of bourbon. The first taste is the roasted malt and dark chocolate. I'm not tasting the coffee that I smelled. There is a faint taste of caramel and the relatively subtle bourbon is noticeable at the finish. I'm missing the dark fruit that I enjoy in an Imperial Stout. For a stout, it's rather thinly-bodied. On the other hand, the bourbon is subtle and with an ABV of 8.5% it is not overpowering. Overall, after being wowed by Double NIckel's Marbled Buffalo, I was a little let down by the BA Stout. It's good, to be sure, but it lacks the "wow" factor of the BA rye ale. With the pop up of so many local breweries (some not so good) I am glad to see another great brewery come into the game. A great stout. I really pick up the bourbon in it. Carmel, coffee and vanilla are other flavors I pick up. I can't wait to try more of their beers. Double Nickel Brewing Company "Buffalo Nickel"
Ahhh, I just got it... "Double Nickel" for the bridge, and "Buffalo nickel" for the coins needed to cross given the time frame (the Tacony-Palmyra bridge opened in 1929; Buffalo nickels were minted between 1913 and 1938). Appearance: Black. Black as coal. Opaque even when held to direct light except for some thin edges of dark mahogany. And yet it's really not that roasty? How can that be? The head is dark in a similar way, kind of like hot chocolate brown. It's foamy-frothy, and it holds remarkably well. I poured it before I started writing and it's still got a finger-thich head to it. The lacing is quite nice as well. Just keep in mind that it's pretty thick, so if you want a great head and lacing you'll have to give it a bit of a vigorous pour to bring it up (unless something happens in aging it). Aroma: The aroma, as noted, is not that roasty. So where is all of this darkness coming from? I can't imagine they used black patent malt, but perhaps they did? Or is it just that the Bourbon is over-riding it, because mainly what I find is Bourbon and occasional coconut over dark chocolate and a small amount of oak. It's not complex, but what's there is rich and full (and that will most likely become an ongoing theme). Flavor: "BAM! ", "Shazaam", "I GAWR-ON-TEE", and "Ohhhh, [email protected]#K ME" (I can't think of any more celebrity chef expressions to use, and I'm certainly not going to fall back on Anthony Bourdain's common limp expression of "That's good. No, that's really good"). Everything in the nose follows pretty much as you find it, with the addition of a little bit more oak, some soft yeasty fruitiness (red berries, apple, pear), and a bit more alcohol. It's well-balanced by a stiff bitterness, and surprisingly not overly-acidic, or roasty, or chocolatey, or hot. If this beer was designed as a vessel to carry the Bourbon and oak they've mastered the trick - it delivers pretty much everything right on. Smooth, balanced, rounded - and yet full. Mouthfeel: Full bodied and smooth with a fine-bubbled, seemingly natural carbonation. Overall: Impressive, big, almost imperial stout flavor and feel heavily drenched in Bourbon with some oak.